Saginaw Bay has a few anglers fishing two to three miles off Pinconning Road and Erickson Road but most of the activity is from Linwood south to the Saginaw River mouth. There are two major pressure cracks out there; the first about a mile off Linwood which is very active and the second one is about three miles out. Yellow perch were caught about a mile out in six feet but the walleye were two to three miles out. A blue and silver jigging rapala or spoons tipped with a minnow worked best. There was a fair amount of activity off the Bay City State Park. Those fishing off the loading docks near Spoils Island did well for walleye in 15 feet. A few were going out from Callahan Road. Not much activity off Vanderbilt Park. Some were fishing the Slot from Sunset Bay Marina and Thomas Road. Perch fishing was a bit slow from Sebewaing to Bay Port where most were averaging only four to five fish. Some good catches were reported out of Mud Creek. Those that did the best waited for the fish to come to them. Walleye anglers were generally fishing between North Island and the tip of Sand Point where they got a few along with a couple lake trout. Anglers are cautioned to stay away from the tip of Sand Point as currents there make for sketchy ice conditions. At Caseville, perch fishing in the marinas was spotty. At Port Austin, a few pike spearing shanties were in the harbor. Saginaw River anglers were fishing the entire length from Wickes Park to the mouth. 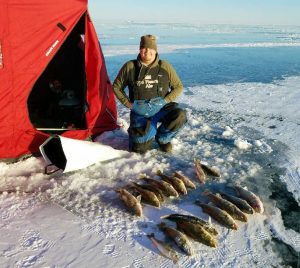 Success has slowed from the usual first-ice, but anglers are picking up some walleye at most locations. In general, fishing was slower the further upstream you go. Most anglers were in 16 to 20 feet on the edge or the middle of the shipping channel and jigging rapalas tipped with minnows. Hot colors were blue and silver, black and gold, fire-tiger or red and silver. Some of the better fishing was near the Zilwaukee Bridge, the south end of Bay City near Cass Avenue, near the Veteran’s Bridge downtown and off Patterson Road. There was a lot of activity just downstream on the Independence Bridge near the U.S.S. Edson but catch rates were spotty. Tittabawassee River had no safe ice for fishing and there is too much ice for navigation. Au Gres Area had a lot of ice shanties south and west of the river mouth. Anglers were getting a mix of walleye, pike and some yellow perch. Down near the Pine River and Palmer Road, perch were caught in three to five feet but catch rates were spotty. Walleye anglers going out to the Catfish Hole have done well in 16 to 17 feet especially in the evening. There was no safe ice north of the river. Au Gres River had a lot of activity with anglers getting some walleye and a few keeper yellow perch. Tawas Area most of the activity was on and around the artificial reef which is up in the “armpit” of Tawas Point and north of Jerry’s Marina in 15 to 17 feet. Anglers were taking a mix of walleye, lake trout and burbot. 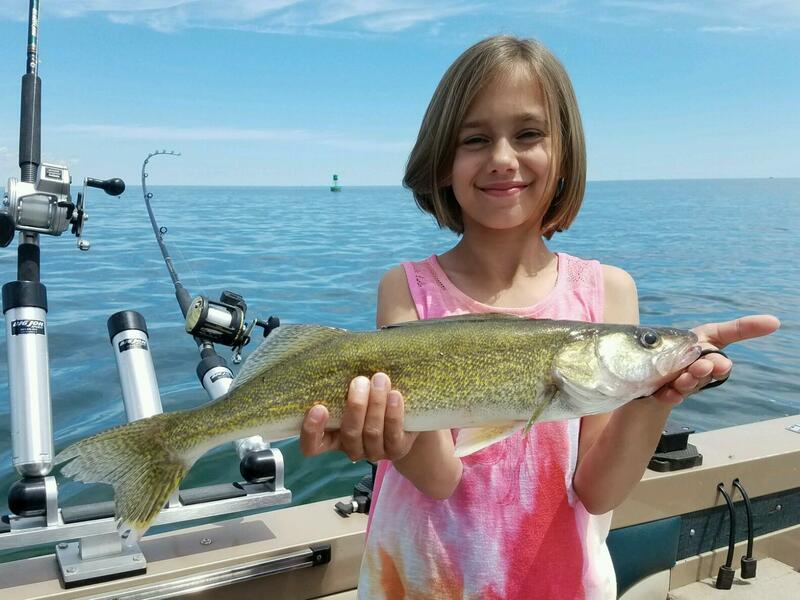 Some were fishing further out in the Bay in 18 to 20 feet and taking walleye. Yellow perch fishing was slow and most of the fish caught were small ones. A couple were spearing pike both in and outside the harbor.